They stock rakes, shovels, salt, light bulbs and charm. I thought I would stop writing about retail, soft drinks, liquor and tobacco when I left Business Week back in 1996. But to paraphrase The Godfather, something about retail keeps pulling me back in. Maybe it's because my great grandfather once had a thriving fur department store in lower Manhattan. The store went bankrupt after my great grandfather died and my grandfather and his siblings took over, an event that caused a major family rift. My father hied off to medical school, rationalizing that a business might close, but a doctor could always find a job. I grew up thinking a store could sustain you or betray you. Needless to say, I still like to shop. For years, I've been wandering around the hardware store in downtown Millburn, looking for bulbs, doormats, batteries and advice. 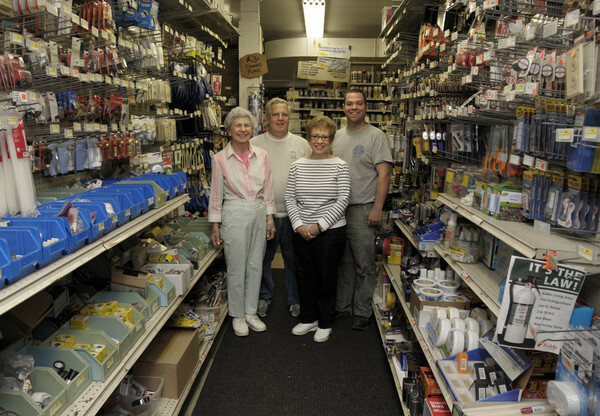 Buncher's Hardware is a charming, cluttered, and wonderfully idiosyncratic place. There aren't many places like it left in the world. Three generations of one family work there together. The store is old-fashioned and the staff is friendly. In some ways, the place feels like a bar: Everybody knows your name and figures you've got a good reason for stopping by. I wrote a story about the store and its family dynamics for Patch. As always, if you'd like to leave a comment on the Patch website, I would be grateful.